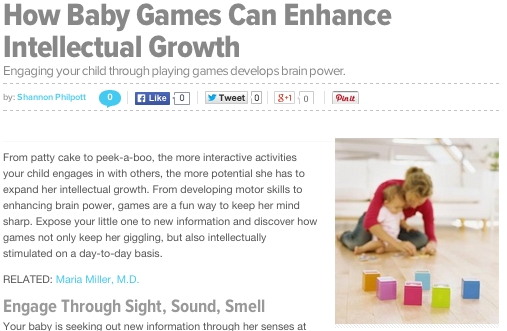 Engaging your child through playing games develops brain power. From patty cake to peek-a-boo, the more interactive activities your child engages in with others, the more potential she has to expand her intellectual growth. From developing motor skills to enhancing brain power, games are a fun way to keep her mind sharp. Expose your little one to new information and discover how games not only keep her giggling, but also intellectually stimulated on a day-to-day basis.